Second in the series, this volume (1526-1707: Mughal Empire) gives a descriptive, analytical and critical survey of the Mughal Empire. The main thesis of the author is that the Mughals were foreign conquerors, albeit Akbar transformed his ruling house into a national monarchy and laid the foundations of a secular nation-state in India. Historical facts have been reorganised and reinterpreted through clear and illuminating expositions, refreshing characterisation of historic personalities and objective assessment of events and movements. Together with maps, a detailed survey of sources, glossary and an elaborate index, the volume makes a notable contribution to the advancement of modern historical literature. J.L. 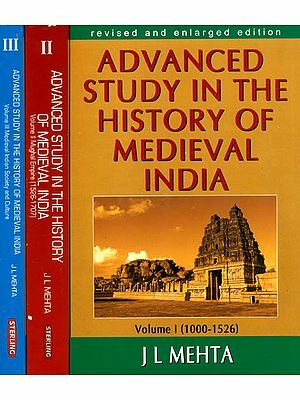 Mehta, a specialist in medieval and modern Indian history, and a prolific writer, with proficiency in Urdu, Persian and Tibetan, besides Hindi, Punjabi and Sanskrit, has published a number of books, articles and monographs. At present he is Reader in the Postgraduate Department of History, Panjab University Evening College, Chandigarh. THIS is the second of the three-volume study on medieval Indian history, the first volume of which was published two years ago; it gives a descriptive, analytical and critical account of the political and military history of the age of the imperial Mughals, from Babar to Aurangzeb (1526-1707). 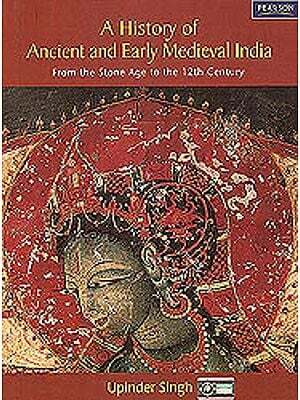 Their period of rule constitutes a glorious era in the annals of medieval Indian history. Babar, though a foreign conqueror, adopted India as the country of his domicile while his worthy descendants not only showed fondness for being thoroughly Indianised, even in blood and breed, but also displayed nationalistic sentiments and identified their interests with those of the sons of the soil. 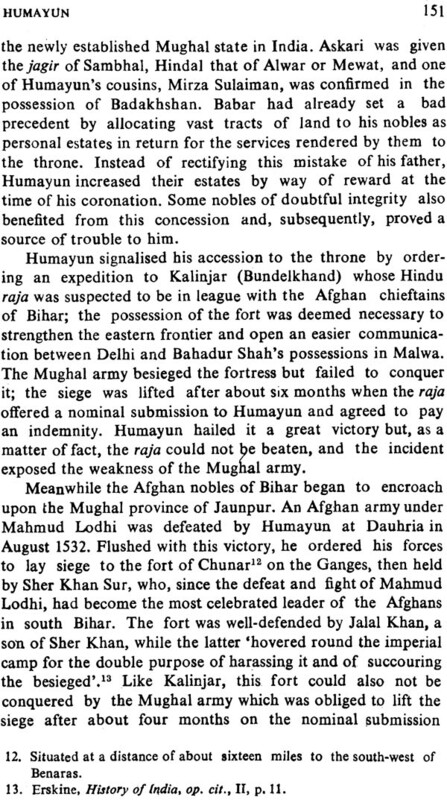 The Mughal period was marked by two centuries of freedom from external invasions and an enduring peace within the empire. 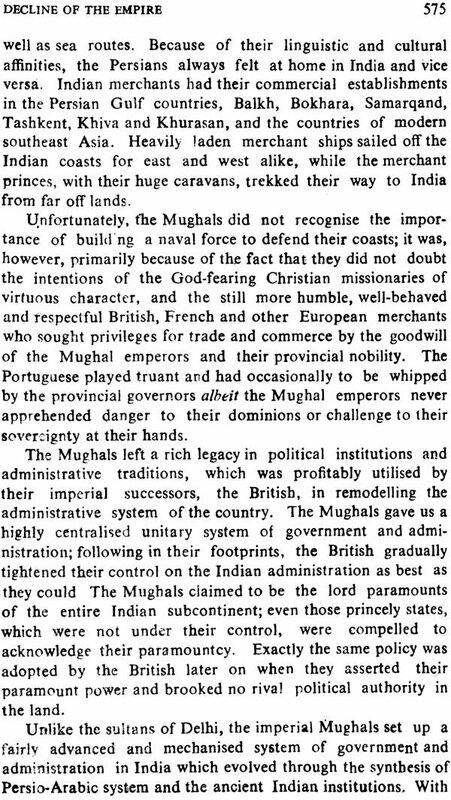 It enabled the Great Mughals to bring about political unification of India by the corporate activity of the nationalist forces, including Hindus and Muslims, under their benign control. The political unity was consolidated by the evolution of uniform system of administration, good government, and the steel-frame of all India services. 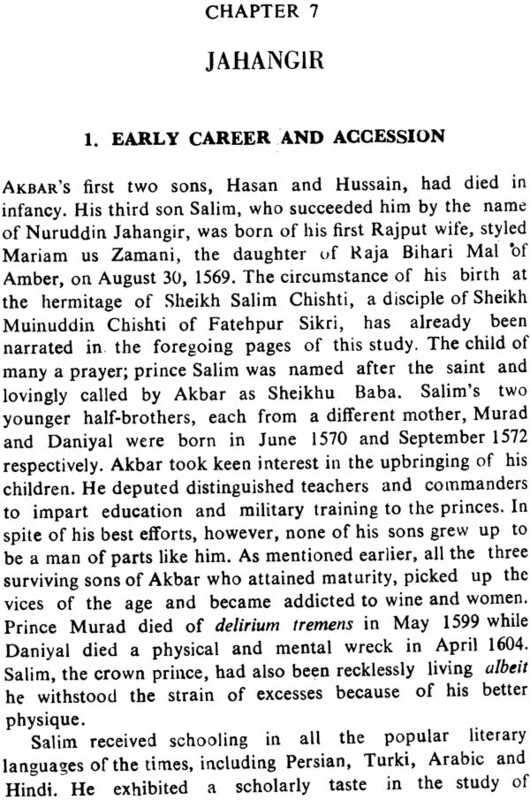 Beginning with Akbar, the Mughals strengthened the forces of national integration and solidarity through equitable treatment towards their subjects, religious toleration and the secular state policy. It provided a requisite environment for the socio-cultural advancement, economic prosperity and all-round development of the country in every walk of its national life. The Mughals played a premier role in effecting a healthy synthesis between the exotic Islamic traditions and ancient Indian culture, thus bringing into existence a new social order, called the Indo-Muslim culture, which was neither Hindu nor Muslim but a synthetic culture of the medieval age. They made invaluable contributions towards appreciation, rather ‘fascination,’ for a really good stuff in print. The author is beholden to them for their valued opinions about the academic merit of his books and owes a special debt of gratitude to them for enabling him to bring about improvements therein in the light of the suggestions made by them. The author has been told by the publishers that his books have been put on the export list and that these have started earning foreign exchange. 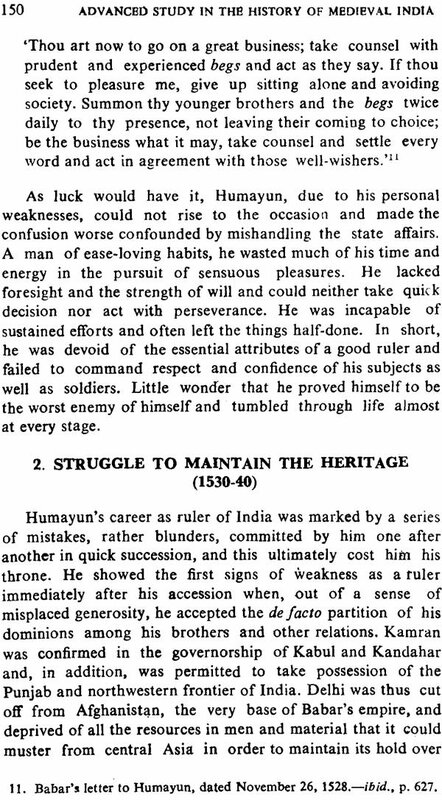 It is really encouraging to note that a reconstruction and interpretation of Indian history by a son of the soil should measure up to the international academic standards and find favour with the scholars of advanced countries, albeit, in his humble opinion, the author attributes this success equally to the resourcefulness and enterprise of Sterling Publishers but for whose dedication and professional expertise it would not have been possible to bring out the books in the shape in which these have been placed in the hands of the scholars. The readers would be glad to know that the first two volumes of this publication have recently been approved by the Government of India as ‘University-Level Text Books’ and that the second revised edition of the second volume is being subsidised by the Central Government through National Book Trust as ‘low-priced paperback’ for the benefit of the students. The author is highly obliged to the Reviewer of the National Book Trust for having made many a useful suggestion for the improvement of the book. 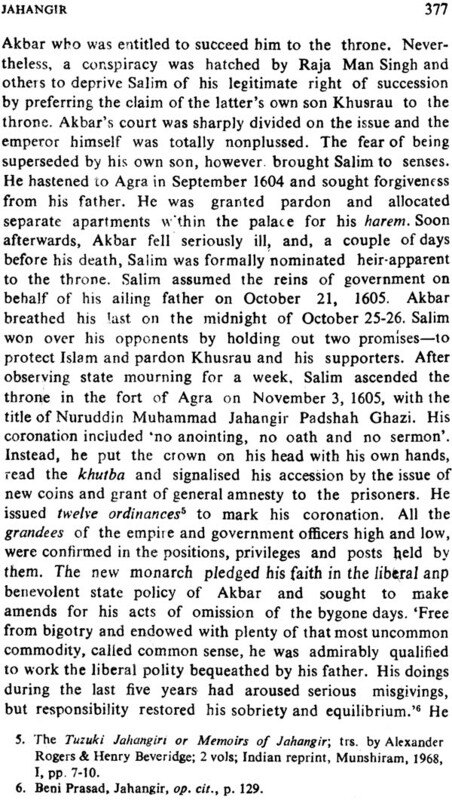 In accordance with his advice, the entire chapter on ‘Aurangzeb’ has been thoroughly revised and re-written so as to bring it in line with the latest researches on the subject; and the author wishes to acknowledge his indebtedness for all sources of information used by him in the reconstruction of the narrative. THE author had, while sending the manuscript of the third volume of his serial publication, Advanced Study in the History of Medieval India, to the press in August last, exhibited ‘a sense of fulfilment and great satisfaction’ on the conclusion of the project. This feeling of relief proved very short-lived, however. Close upon its heels, he received a warning-shot from the publishers that he should start revising the text of the first two volumes as their first edition had nearly been exhausted. He was as yet half-way through the first volume in his attempt to revise it, when the publishers had to bring out its reprint in the mid-session to meet the persistent demand from students and scholars from all over the country; for want of time, even the revisions carried out by the author could not be incorporated therein. 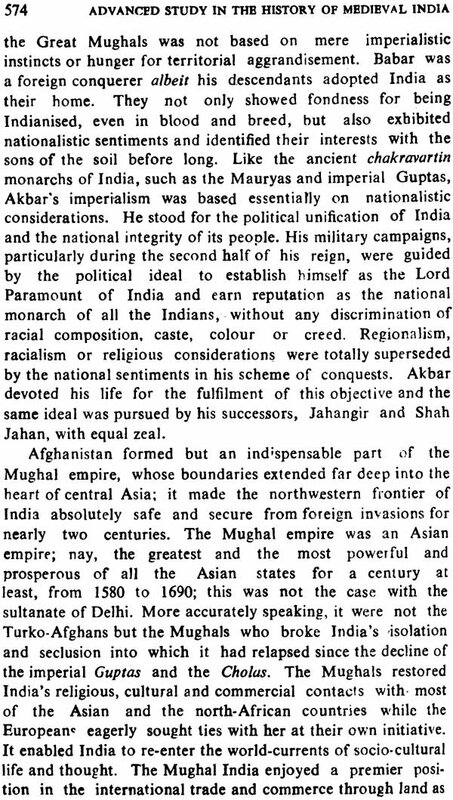 Nevertheless, it provided an opportunity to him to concentrate his attention on volume II, entitled, The Mughal Empire, which is now being presented to the readers in the form of a second, revised and enlarged edition. The task of preparing the revised edition was made comparatively easy by the pleasure and satisfaction derived from the correspondence with the readers and by the challenge of press opinions and constructive criticism from students and scholars from various parts of the country. Needless to say, the author now maintains a separate file on such correspondence, pertaining to his three-volume publication, which has been growing in bulk beyond all expectations. 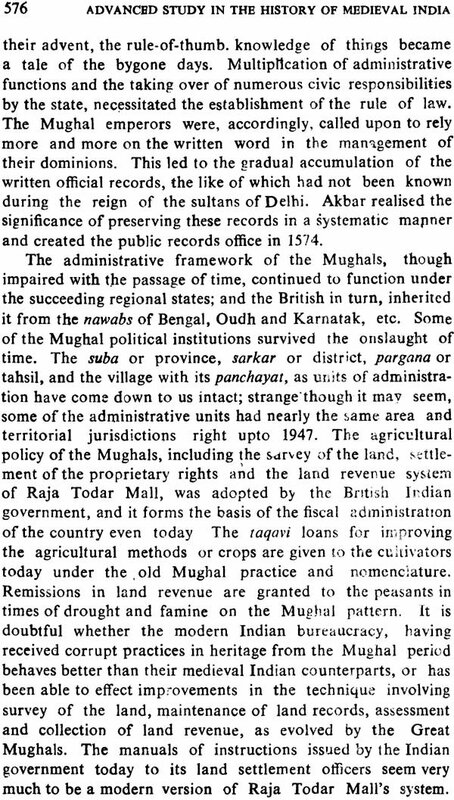 Whereas, it indicates, on the one hand, the growing popularity of his books among the postgraduate students and researchers in the history of medieval India as also among those preparing for the competitive examinations of the Union Public Service Commission and those of the various states, on the other hand, it shows the intellectual hunger of the Indian readers and their sense of the growth and development of the Indo-Muslim society and left an indelible mark on the socio-political institutions of the times. An humble attempt has been made in the foregoing pages of this study to reconstruct the saga of their political and military exploits, and review their achievements and failures on the national front, as objectively as humanly possible. Of course, the author lays special emphasis on the countrywide or national aspect of history and strives to give a critical analysis of the Indo-Muslim polity of the times. The Introductory note should make the readers familiar with the valley of Ferghana, the homeland of Babar. Two pen-portraits of the valley have been drawn so as to enable them to form vivid, though sharply contrasting, pictures of its landscape in their minds ; the one is intended to trigger off their flight of imagination to the fairyland of bygone days where Babar and his dare-devils trod their horses or walked barefooted up and down the ravines, fighting desperately for mere survival; while the second takes the readers in the merry- go-round of the circular railways through the oil-fields and industrial complex of Ferghana in the Soviet Socialist Republic of Uzbekistan. 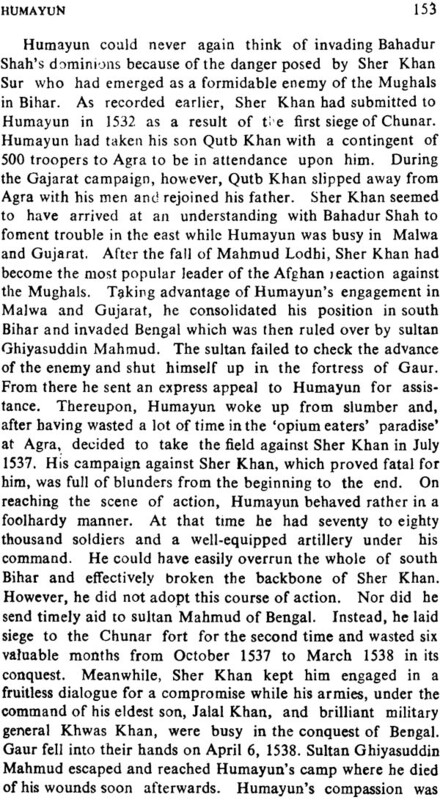 A probe into the remote ancestry of Babar, which establishes his blood relationship with Changes Khan and Amir Timur. The two outstanding historic personalities of Central Asia, may act as a catalytic agent to arouse the readers’ interest in the study; it forms section two of the prologue. A fairly comprehensive survey of the Contemporary Sources of History, along with the modern works available on each aspect, has been given in the form of a fully documented article in the third section of the prologue. The opening chapter gives a glimpse of the Pre-Mughal India in the beginning of the sixteenth century when the suiranate of Delhi had been reduced to a small feudal principality, ruled over by the Lodhis, and surrounded by more powerful provincial and regional states. It analyses the silent features of the pre-Mughal Indian polity and describes the political and military condition of the regional states, with occasional references, in historic perspective, to the origin and growth of their power in the fifteenth century so as to make their position more intelligible to the readers. Section three of the chapter gives a bird’s-eye view of the socio-cultural condition of India on the eve of Babar’s invasions while the fourth section describes the political, social and economic condition of India as observed by Babar; it makes a special reference to the Indian landscape and the concept of Indian nationhood as understood by that ‘soldier of fortune’ and ‘architect’ of the Mughal empire. 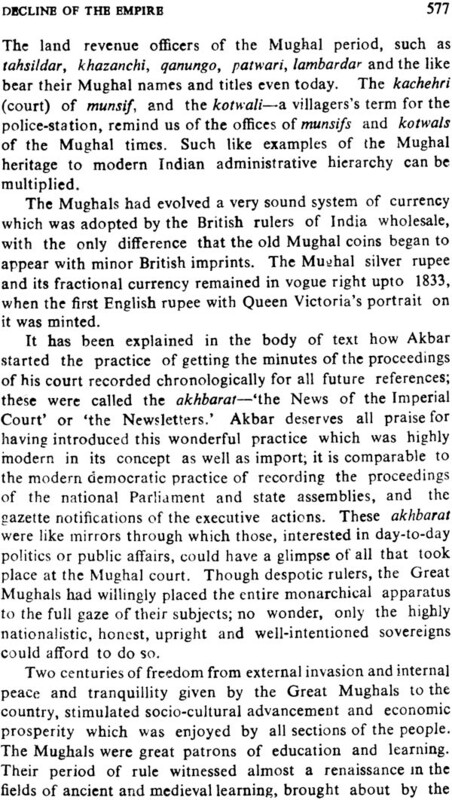 The Mughal period constitutes a popular and widely-read epoch of Indian history; the author, therefore, breaks the tradition by withholding the chapter-wise synopsis of the main text from the readers with the assumption that the real charm of the story may lie in going through the book itself. Of course the list of contents, which is inclusive of sectional headings and subheadings, does give a general idea of the main contents of the study; as for the reorganisa ion of the facts and the line of thought adopted by the author in their reinterpretation, let the readers form their own opinion. 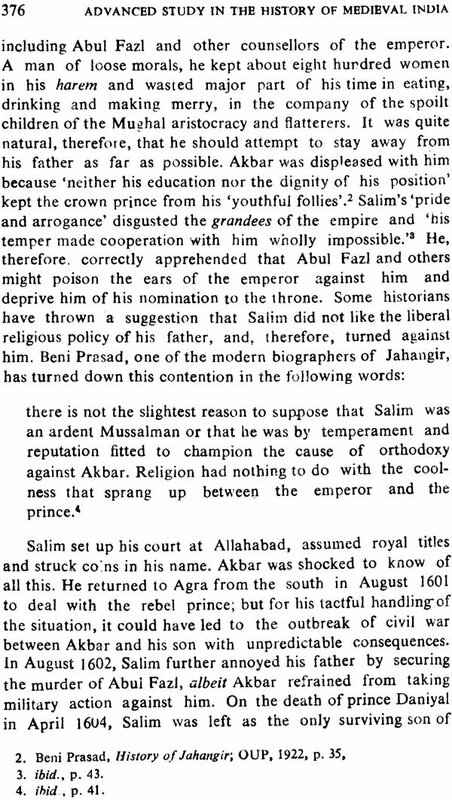 Suffice it to say that the main thesis of the author in this volume of the series is that the Mughals were foreign conquerors albeit Akbar, the illustrious grandson of Babar, transformed his ruling house into a national monarchy and laid the foundation of secular nation state in India. 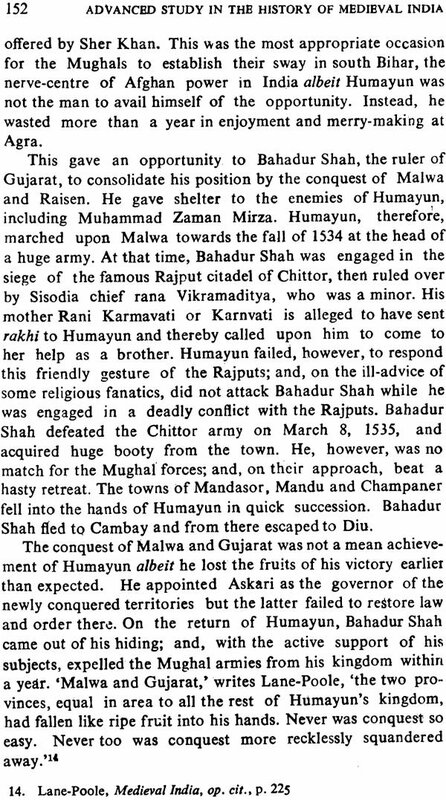 Like the ancient chakravartin rulers, such as the Mauryas and the imperial Guptas, Akbar’s imperialism was based essentially on nationalistic considerations. He separated religion from politics, rejected the Islamic theory of state, and declared himself to be the national monarch of India; it was he who raised the policy of religious toleration to the pinnacle of secularism. 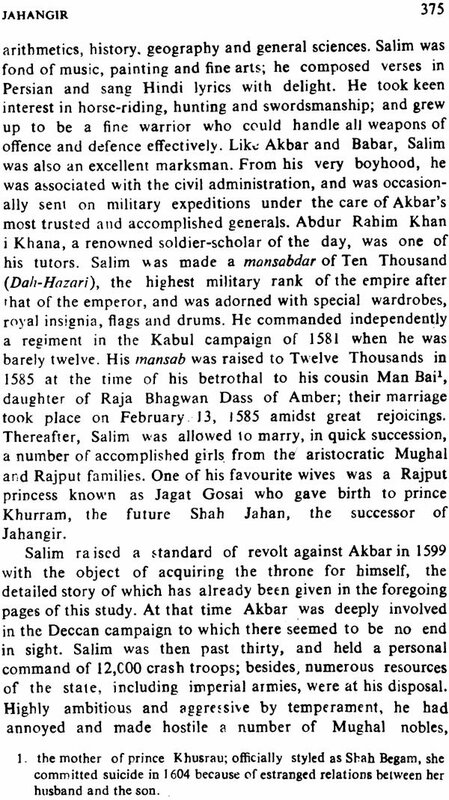 By befriending the Rajputs, ‘the sword-arm of ancient India’, and by according an honourable and equitable treatment to the other Hindu elite, Akbar made them partners in the fulfilment of his national objectives, in which regionalism, racialism, parochialism or religious prejudices found no place whatsoever. Yet another scholar, Dr Suryanath V. Kamath, finds the first volume to be ‘highly informative and analytical in its approach’; he pays compliments to the author in high-sounding terms which surpass the latter are most sanguine expectations. Similarly, a number of letters have been received by the author from his friends and acquaintances, including his revered teacher Professor Han Ram Gupta, as also from some of the postgraduate students and researchers in all-out praise of the preceding volume. The generosity of their recognition makes the author feel rather small when he thinks of his own shortcomings and the imperfections of his humble attempt. He gratefully acknowledges their valued opinions and compliments: how keenly does he wish chat he could really have deserved the praise that they have so generously showered on him! The author is deeply impressed by the arguments advanced forward by Dr Kamath in support of his contention, and would strive to make up this deficiency in the revised edition of the first volume in the near future. The author is fully conscious of his duty towards the society and the posterity to conduct himself as an honest and objective writer and teacher; it is in this spirit that he has declared the book to his maternal grandchildren, Paras and Daisy—the two innocent tiny tots of angelic virtues, the custodians of future India and hope of mankind in the twenty-first century. They provided him with much-need relief and recreation in the midst of his tiresome studies ad inspired him to carry on the work with devotion.